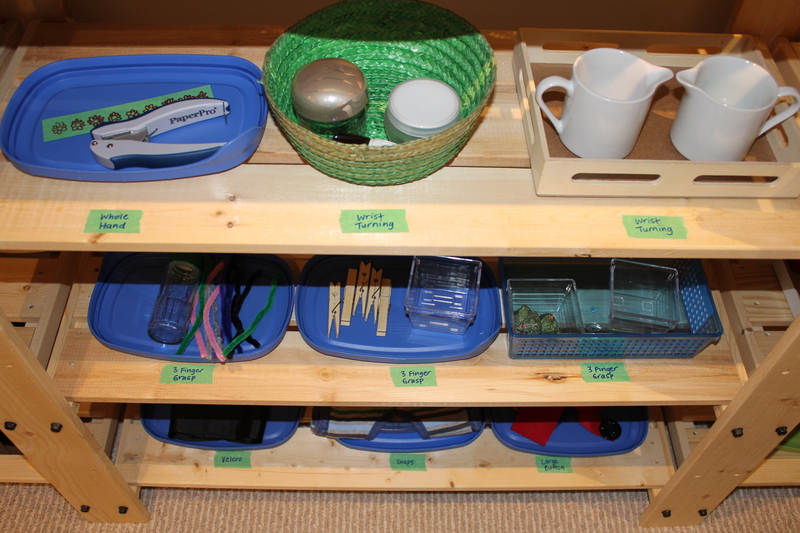 You’ve all seen it — the beautiful Montessori classrooms that have every activity laid out in order from simplest to most complex, each in their own color-coded section with matching colored materials. While I long to have this like I long to have a new Prada handbag, I knew that (a) it wouldn’t be possible with a small room, and (b) even if I had a lot of space, it wouldn’t be a good idea for a homeschool setting with only one child. I know I need to rotate the activities to keep them fresh, but I was having a difficult time deciding which activities to keep whilst still ensuring that all the primary “skills” (that are age-appropriate) are available for Z to choose from. So here’s what I did. I stuck labels of the skills that I felt was needed for Z at this time. For Practical Life, I decided I wanted to keep one whole hand exercise, two wrist turning exercises, three 3-finger grasp exercises, and three dressing “frame” exercises. There’s a lot more in Practical Life, of course, such as care of the environment, care of self, cooking preparation, etc … but I decided for our family that those are best done in the rest of the house as part of everyday life. So when he got bored of one activity, I could just flip through my KHT album and quickly replace the tray with another activity within the same skill set. But before I do that, I’ll change the objects/materials within the same activity first — maybe use a different bowl or container, a different tong, or different objects to tong — to see if that re-engages him. What do you think of my strategy for shelf organization? I’d love to hear your thoughts!